SCVHistory.com AL2020 | St. Francis Dam Disaster | Castaic Highway Bridge Destroyed by Floodwaters, March 1928. Metal truss auto bridge on the Ridge Route at Castaic Junction destroyed by flood waters of the St. Francis Dam, March, 1928. Real photo postcard. 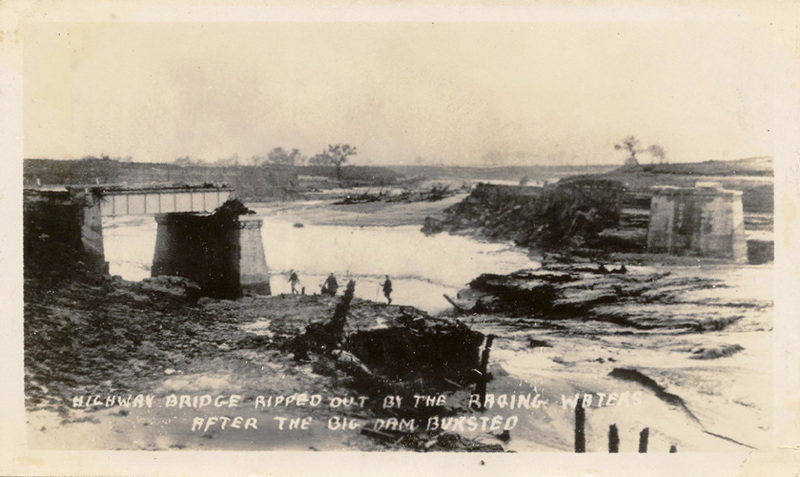 Caption reads: "Highway bridge ripped out by the raging waters after the big dam bursted." AL2020: 9600 dpi jpeg from 300 dpi jpg of original photograph, collection of Dr. Alan Pollack.